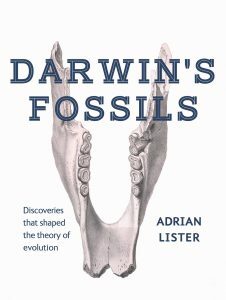 Explore Darwin’s pioneering work on fossils in this richly illustrated book. In On the Origin of Species Charles Darwin credited his discoveries of fossils, as much as those of living creatures, as the stimulus for his theory of evolution. Darwin’s Fossils is an accessible account of his pioneering work on fossils, his adventures in South America and his relations with the scientific establishment. While Darwin’s work on Galapagos finches is celebrated, his pioneering work on fossils is much less well known. He was the first to collect the remains of giant extinct South American mammals; he worked out how coral reefs and atolls formed; he excavated and explained marine fossils high in the Andes; and he discovered a fossil forest that now bears his name. All of this was fundamental in leading him to his theory of evolution. Many of Darwin’s fossils survive, at the Natural History Museum and elsewhere, and recent years have seen a surge of scientific interest and research into them. Richly illustrated with new photography of many of the fossils, superb line drawings produced in the 19th century, and newly-commissioned artists’ reconstructions of the extinct animals as understood today, Darwin’s Fossils reveals how fossils played a crucial role in the development of his revolutionary ideas. 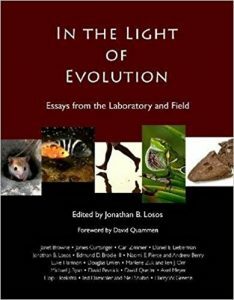 In the Light of Evolution is a collection of essays by leading scientists, and includes essays by science writer Carl Zimmer, historian Janet Browne, and a foreword by journalist David Quammen. As Quammen says in his foreword, the book collects “reports from the field, plainspoken descriptions of lifetime obsessions, hard-earned bits of wisdom, and works in progress, pried loose from some of the most interesting, eminent researchers in evolutionary biology…” It is a book “for readers who are fascinated by evolutionary biology and who desire to understand better the day-by-day, species-by-species, ecosystem-by-ecosystem texture of its practice as a scientific profession.” The book is intended for anyone with an interest in evolution, and it can be used in a wide variety of courses, including major’s and non-major’s introductory biology and evolution classes. 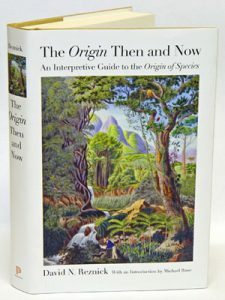 The Origin then and now: an interpretive guide to the Origin of Species. Artist/Author: Reznick, David N. and Michael Ruse. Charles Darwin’s Origin of Species is one of the most widely cited books in modern science. Yet tackling this classic can be daunting for students and general readers alike because of Darwin’s Victorian prose and the complexity and scope of his ideas. This book is a unique guide to Darwin’s masterwork, making it accessible to a much wider audience by deconstructing and reorganizing the Origin in a way that allows for a clear explanation of its key concepts. The Origin is examined within the historical context in which it was written, and modern examples are used to reveal how this work remains a relevant and living document for today. In this eye-opening and accessible guide, David Reznick shows how many peculiarities of the Origin can be explained by the state of science in 1859, helping readers to grasp the true scope of Darwin’s departure from the mainstream thinking of his day. He reconciles Darwin’s concept of species with our current concept, which has advanced in important ways since Darwin first wrote the Origin, and he demonstrates why Darwin’s theory unifies the biological sciences under a single conceptual framework much as Newton did for physics. Drawing liberally from the facsimile of the first edition of the Origin, Reznick enables readers to follow along as Darwin develops his ideas. This book is an indispensable primer for anyone seeking to understand Darwin’s Origin of Species and the ways it has shaped the modern study of evolution. This sumptuous large-format book was first produced in 2009 to celebrate the 50th anniversary of the foundation of the Charles Darwin Foundation on Galapagos. 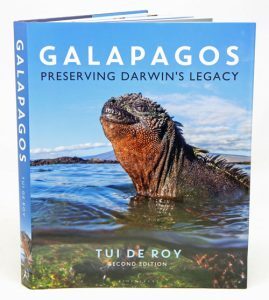 The book comprises a series of invited essays under the editorship of world-renowned photographer and long-term Galapagos resident, Tui de Roy, who has also provided most of the photographs. The authoritative essays cover the entire spectrum of Galapagos wildlife including the marine environment, unique vegetation such as sunflower trees as well as wildlife including giant tortoises, marine iguanas, sea lions and the Galapagos finches that inspired Darwin’s theory of evolution. This new edition has significant updates to a number of chapters including brand new photography and information about scientific developments elsewhere and a new jacket. Artist/Author: Parker, Steve and Alice Roberts. This comprehensive book traces an extraordinary journey, spanning 4 billion years, from the emergence of bacteria to the rise of the species that coexist today. An understanding of evolution has a profound effect on our appreciation of the natural world. The plants and animals alive today account for only one per cent of the species that have ever lived, and this book will enable you to understand why and how the other 99 per cent perished. In this book you will encounter pivotal evolutionary turning points, uncover false starts and global disasters, and trace the crucial scientific breakthroughs that have contributed to our understanding of this planet and the creatures on it. This book provides a complete account of all major life groups, from early single-celled organisms to the emergence of todays species. Features a spectacular variety of images, including fossils, skeletons, life-like reconstructions and living plants and animals. Chronological timelines plot key evolutionary events and discoveries for each major group. This book stands alone amongst the major textbooks by focusing on key principles to offer a truly accessible, unintimidating treatment of evolutionary biology. With adaptation through natural selection – how the integrated complexity of living organisms comes about – as its central theme, the book adopts a lucid, crystal-clear narrative to explain the mechanism of evolution and its main outcomes. Chapters are grouped into six themed parts – basics, history, origins, adaptation, selection, and interaction – and the text is regularly interspersed with descriptive headings that set out a clear path through the subject. 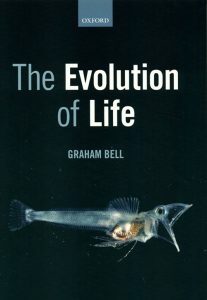 The Evolution of Life is written to instil a true understanding of the essential principles of evolutionary biology without that understanding being compromised by peripheral detail. As such, it is the ideal introduction for any student encountering this fascinating subject for the first time. Online Resource Centre The Evolution of Life is supported by the following online resources: For registered adopters: – Figures from the book in electronic format for use in lectures – A set of exam questions for each chapter – Journal Clubs: discussion questions that guide students through research papers related to each chapter For students: – Programs and interactive spreadsheets related to activities posed in the book. Darwin’s on the origin of species: a modern rendition. Charles Darwin’s most famous book On the Origin of Species is without question, one of the most important books ever written. While even the grandest works of Victorian English can prove difficult to modern readers, Darwin wrote his text in haste and under intense pressure. For an era in which Darwin is more talked about than read, Daniel Duzdevich offers a clear, modern English rendering of Darwin’s first edition. Neither an abridgement nor a summary, this version might best be described as a “translation” for contemporary English readers. A monument to reasoned insight, the Origin illustrates the value of extensive reflection, carefully gathered evidence, and sound scientific reasoning. By removing the linguistic barriers to understanding and appreciating the Origin, this edition aims to bring 21st-century readers into closer contact with Darwin’s revolutionary ideas. 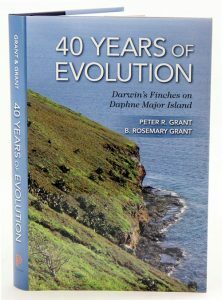 40 Years of evolution: Darwin’s finches on Daphne Major Island. Artist/Author: Grant, Peter R. and B. Rosemary Grant. Renowned evolutionary biologists Peter and Rosemary Grant have produced landmark studies of the Galapagos finches first made famous by Charles Darwin. 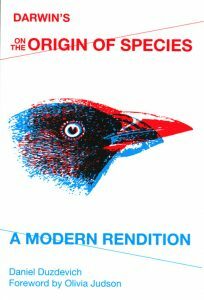 In “How and why species multiply”, they offered a complete evolutionary history of Darwin’s finches since their origin almost three million years ago. Now, in this richly illustrated new book, the authors turn their attention to events taking place on a contemporary scale. By continuously tracking finch populations over a period of four decades, they uncover the causes and consequences of significant events leading to evolutionary changes in species. The authors used a vast and unparalleled range of ecological, behavioural, and genetic data, including song recordings, DNA analyses, and feeding and breeding behaviour, to measure changes in finch populations on the small island of Daphne Major in the Galapagos archipelago. They find that natural selection happens repeatedly, that finches hybridize and exchange genes rarely, and that they compete for scarce food in times of drought, with the remarkable result that the finch populations today differ significantly in average beak size and shape from those of forty years ago. The authors’ most spectacular discovery is the initiation and establishment of a new lineage that now behaves as a new species, differing from others in size, song, and other characteristics. The authors emphasize the immeasurable value of continuous long-term studies of natural populations and of critical opportunities for detecting and understanding rare but significant events. By following the fates of finches for several generations, this book offers unparalleled insights into ecological and evolutionary changes in natural environments. How the snake lost its legs: curious tales from the frontier of Evo-devo. How did the zebra really get its stripes, and the giraffe its long neck? What is the science behind camel humps, leopard spots, and other animal oddities? Such questions have fascinated us for centuries, but the expanding field of evo-devo (evolutionary developmental biology) is now providing, for the first time, a wealth of insights and answers. 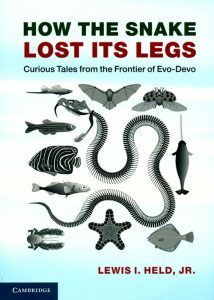 Taking inspiration from Kipling’s ‘Just So Stories’, this book weaves emerging insights from evo-devo into a narrative that provides startling explanations for the origin and evolution of traits across the animal kingdom. Held’s unique and engaging style makes this narrative both enlightening and entertaining, guiding students and researchers through even complex concepts and encouraging a fuller understanding of the latest developments in the field. The first five chapters cover the first bilaterally symmetric animals, flies, butterflies, snakes, and cheetahs. A final chapter surveys recent results about a menagerie of other animals. Artist/Author: Losos, Jonathan B. et al. editors. 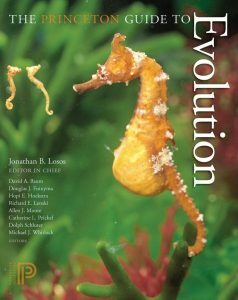 A comprehensive yet concise reference to the major subjects and concepts in evolutionary biology, from genes to mass extinctions. 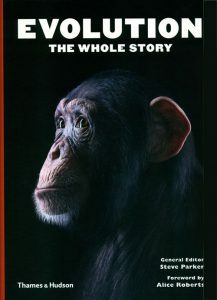 With contributions from leading researchers, the guide contains some 100 clear, accurate, and up-to-date articles on the most important topics in seven major areas: phylogenetics and the history of life; selection and adaptation; evolutionary processes; genes, genomes, and phenotypes; speciation and macroevolution; evolution of behavior, society, and humans; and evolution and modern society. 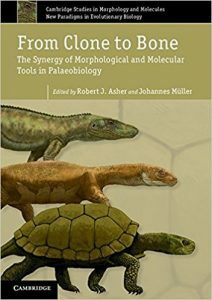 Complete with glossaries of key terms, suggestions for further reading on each topic, and an index, this is an essential volume for undergraduate and graduate students, scientists in related fields, and anyone else with a serious interest in evolution. 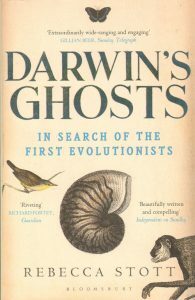 Darwin’s ghosts: in search of the first evolutionists. NOW IN PAPERBACK. Just one month after the publication of “On the Origin of Species”, Darwin received a letter that deeply unsettled him. It accused Darwin of failing to acknowledge his predecessors, of having taken credit for a theory that had already been discovered by others such as Baden Powell and Darwin’s own grandfather. Darwin knew he had made a grave error in omitting to mention his intellectual forebears. Yet when he tried to trace these natural philosophers, he found that history had already forgotten them. In this book, historian and novelist Rebecca Stott rediscovers Aristotle walking the shores of Lesbos with his pupils and Leonardo da Vinci searching for fossils in the mine shafts of the Tuscan hills; Diderot, in Paris, under the surveillance of the secret police, exploring the origins of species, and the brilliant naturalists of the Jardin de Plantes first recognising proof of evolutionary change in the natural history collections stolen during the Napoleonic wars. This book is a masterful retelling of the collective daring of a few like-minded men who had the imagination to speculate on nature’s ways and the courage to publish at a time when to do so, for political as well as religious reasons, was to risk everything. More than a tale of mummified birds, inland lagoons, Bedouin nomads, secret police files, microscopes and curiosity cabinets, this is the story of an idea that would change the modern world. Also available in hardcover [stock id 34067].